Once we understand that we might all be blind men trying to understand a larger truth, and that our goals are rarely mutually exclusive, we can avoid the trap of demonizing our opponents. We can avoid labels like Pro-Choice or Open-Borders because we understand the implications they carry. More explicitly, we can stop saying things like “Gee you must hate America” or “My opponent wants to kill babies/enslave women” Such attacks immediately shut down any hope of productive conversation. Far too often in political debates I have seen candidates use slurs and loaded words to characterize their opponents. One speaks of their goals, and of their opponent’s agenda (a much scarier word). One is a socialist, and the other must be a racist, and as the shouting escalates, they only serve to convince us the labels are correct. Rather than using — or even allowing — racial prejudices and fears to shape his message, he defended the integrity of his opponent and focused on their differing ideas. This enables further conversation and respect, and keeps the doors open to working together in the future. Once we start down the road of demonizing those with whom we disagree, we lose any opportunity of collaborating in the future, and we push ourselves further and further apart. 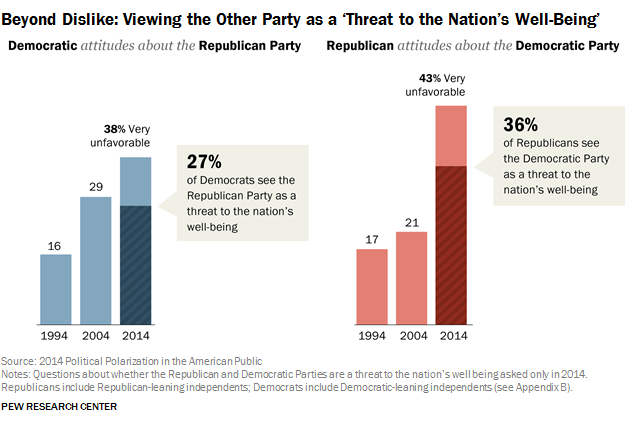 In fact, a growing number of Americans are starting to consider people of different political parties to be a “threat to the nation’s well-being”. I consider this one of the greatest dangers we face. Instead, we should learn to depend on our differences to help us see the larger picture, to understand the whole elephant, and to find solutions that work towards our various goals. To view lack of conflict as optimum is like saying a sunny day is optimum. A sunny day is when the sun wins out over the rain. There’s no conflict. You have a clear winner. But if every day is sunny and it doesn’t rain, things don’t grow. And if its sunny all the time — if, in fact, we don’t even have night — all kinds of things don’t happen and the planet dries up. The key is to view conflict as essential, because that’s how we know the best ideas will be tested and survive. Conflict is a necessary part of overcoming our biases and creative blocks, but only if we allow it do so. Healthy conflict requires respect by all parties. Try this: rather than reaching for the nearest, easiest slur (like racist), frame your conversation in compliments. So rather than saying, “This is a racist policy, how could you support this?” try this instead: “You’re one of the most charitable people I know; can you help me understand how you see this issue?” Can you imagine how that will enable conversation rather than causing each person to become offended and put up walls? When faced with complexity, it is reassuring to tell ourselves that we can uncover and understand every facet of every problem if we just try hard enough. But that’s a fallacy. The better approach, I believe, is to accept that we can’t understand every facet of a complex environment and to focus, instead, on techniques to deal with combining different viewpoints. If we start with the attitude that different viewpoints are additive rather than competitive, we become more effective because our ideas or decisions are honed and tempered by that discourse. Don’t enter any conversation with so much bravado and pride that admitting you were wrong becomes impossible. Instead, begin each conversation with the intent to learn, and to explore ideas rather than proving yourself right. Even if you are certain in your views, it’s classier to speak calmly and humbly rather than looking for a fight. If saying “You’re right” or “I was wrong” is too hard, an easier option might be: “You’ve given me a lot to think about, thank you” or “I’m not sure I agree, but I do understand your position better, thanks for taking the time to clarify for me”. You can also validate them: “I can tell you really care about this, and I admire that.” These option are gracious and humble without admitting defeat. When wrapping up a discussion online, GIFs are a fun way to lighten the mood and end on a friendly note. Combined with #2 above, a high-five GIF can go a long way. Or, if the conversation was face-to-face, you could text them a GIF afterwords. I’m tellin ya: GIFS will heal this country. We face a lot of big problems in our society. Years of tradition, political corruption, and unjust systems have solidified these problems and it’s overwhelming to think about tackling all of them. By improving our conversations, I don’t mean to suggest that federal law will instantly change or that hatred and division will cease. But on an individual level, if we learn to trust each other instead of fearing the “other”, we will be less likely to believe the hatred and lies when we hear them. We will be more able to stand up for one another and inspire unity and respect. And yes, if enough people come together, fixing our conversations might just fix a lot of other things too.